"Victory March to Glory Land"
Liberland, officially the Free Republic of Liberland, is a micronation claiming an uninhabited parcel of disputed land on the western bank of the Danube, between Croatia and Serbia. It was proclaimed on 13 April 2015 by Czech right-libertarian politician and activist Vít Jedlička. The land in question has no infrastructure and lies on a floodplain. The official website of Liberland states that the nation was created due to the ongoing Croatia–Serbia border dispute, in which some areas to the east of the Danube are claimed by both Serbia and Croatia, while some areas to the west, including the area of Liberland, are considered part of Serbia by Croatia, but Serbia does not claim them. The size of the land in question is 7 square kilometres (2.7 sq mi; roughly the same as Gibraltar). It has been administered by Croatia since the Croatian War of Independence. There has been no diplomatic recognition of Liberland, although it has established relations with Somaliland (also unrecognized). The dispute regarding the border along the Danube River valley first arose in 1947 but was left unresolved during the existence of the Socialist Federal Republic of Yugoslavia. It became a contentious issue after the breakup of Yugoslavia. Serbia holds the opinion that the thalweg of the Danube valley and the centerline of the river represents the international border between the two countries. Croatia disagrees and claims that the international border lies along the boundaries of the cadastral municipalities located along the river—departing from the course at several points—reflecting the course of the Danube which existed in the 19th century before meandering and hydraulic engineering works altered its course. As a result, Croatia claims a large part of the disputed area controlled by Serbia, while Serbia does not claim the much smaller parts controlled by Croatia. Jedlička says that the land he has claimed, known as Gornja Siga (meaning upper tufa), was not claimed by either side. The area is about 7 square kilometres (2.7 sq mi), about the same size of Gibraltar, and most of it is covered with forests. There are no residents. A journalist from the Czech newspaper Parlamentní listy who visited the area in April 2015 found a house that had been abandoned for about thirty years, according to people living in the vicinity. The access road was reported to be in a bad condition. The Danube, an international waterway with free access to the Black Sea for several landlocked nations, runs along the self-proclaimed territory. The territory claimed by Liberland is situated at the largest green-colored land parcel, marked as "Siga" on the map. Due to differences in the border definitions, the yellow-colored parts to the east are claimed by both Serbia and Croatia. 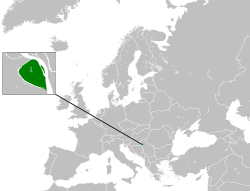 Croatia asserts that the green parts are part of Serbia, but Serbia does not claim them. This led Jedlička to assert that the green parts have remained unclaimed by both sides. The flag raising in Gornja Siga was performed by Vít Jedlička and some of his associates on the same day the republic was proclaimed. Jedlička is a member of the Czech Party of Free Citizens, which bases its values on the classical liberal ideology. Jedlička stated that no nation claims the land as its own and he therefore could claim it using the terra nullius doctrine. The border, he argued, was defined in accordance with Croatian and Serbian border claims and did not interfere with any other state's sovereignty. Jedlička said in April 2015 that an official diplomatic note would be sent to both Croatia and Serbia, and later to all other states, with a formal request for international recognition. On 20 April 2015, Jedlička delivered a lecture at the Prague School of Economics, titled "Liberland – how a state is born" (Czech: Liberland – jak vzniká stát). He discussed various aspects of the project and the interest it has attracted around the world. One topic that he brought up was the Montevideo Convention; he explained that Liberland intended to satisfy the principles of the convention, which is commonly used to define a state. At the time of the lecture, the Liberland project had assigned ten people willing to handle foreign relations. Other topics covered in the lecture included the concept of voluntary taxation and how the large number of citizenship applications had made it necessary to restructure the citizenship process to be more effective, since it was only based on an e-mail account. On 18 December 2015, Jedlička held an event at which he presented the first provisional government of Liberland and its ministers of finance, foreign affairs, interior and justice as well as two vice presidents. The flag consists of a yellow backdrop (symbolizing libertarianism, free markets) with a black stripe running horizontally through the centre (symbolizing less government, anarchy/rebellion) and the coat of arms in the centre. Within the coat of arms, the bird represents freedom, the tree represents prosperity, the blue river represents the Danube River, and the sun represents happiness. Croatian authorities have frequently blocked access to the area since the beginning of May 2015. In May 2015, Vít Jedlička and his translator Sven Sambunjak were briefly detained by Croatian police after making an attempt to cross the border. Jedlička spent one night in detention and then was convicted and ordered to pay a fine for illegal crossing of the Croatian border but appealed the verdict. He claimed that there were at least three Liberland citizens inside the area, who came from Switzerland. Later that month, Vít Jedlička was detained again. Initially, reporters were able to enter the area with Jedlička but subsequently they were also denied entry, including journalists from the Serbian public broadcast service Radio Television of Vojvodina, and from the Bosnian newspaper Dnevni avaz. The detained were from various countries, including Ireland, Germany, Denmark, and the United States. Croatian police have continued detaining people, including those that entered the area by boat (via an international waterway). One of them, Danish activist Ulrik Grøssel Haagensen, was placed in house arrest for 5 days before being sentenced to 15 days of prison, triggering some protests in Denmark. In May 2016, several appeals court decisions from Croatia were published. The court upheld that crossing into Liberland from Croatia is illegal, but found the convictions for entering Liberland from Serbia improper. The court said that the lower court committed "a fundamental breach of misdemeanor proceedings" and "essential procedural violations". It further ruled that "the facts were incorrectly and incompletely established [by the prosecutor] which could lead to misapplication of substantive law". A retrial was ordered in 6 of the 7 appeals. The lower court is required to determine the location of the border and the border crossing. Journalists have been uncertain as to how serious Jedlička is about his claims, with some calling it a publicity stunt. In an interview with Parlamentní Listy in April 2015, Jedlička claimed that he had received positive reactions for his initiative, mainly from his own party the Party of Free Citizens, for which he was a regional chairman, but also from some members of the Civic Democratic Party and the Pirate Party. On 20 May 2015, Petr Mach, the leader of the Party of Free Citizens, expressed support for the creation of a state based on ideas of freedom, adding that the Party of Free Citizens wants the Czech Republic to become a similarly free country. Dominik Stroukal from the Czech-Slovak branch of the Ludwig von Mises Institute wrote: "The escapade succeeded for Vít. The whole world reports about Liberland with words like 'tax competition', 'libertarianism', etc." Goran Vojković, professor of law and columnist from the Croatian news portal Index.hr, described Liberland as a "circus which threatens Croatian territory", and argued that there was a risk that Croatia's claim to control land on the other side of the Danube may be weakened by the attention that the Liberland project has drawn to the border dispute. In 2016, an article in Stratfor summarized the initiative as follows: "Liberland is a curious case because, in principle, none of the actors that could claim control over it seems interested in doing so. But this will probably remain a curiosity with negligible consequences at the international level. For the rest of the world's disputed territories, violence and diplomacy will remain the main tools to claim ownership. Legal experts in both Serbia and Croatia have said that, under international law, Jedlička lacks the right to claim the area, which is currently the subject of a dispute between the two nations. Croatia and Serbia have dismissed Jedlička's claims as frivolous, although the two countries have reacted in different ways. On 24 April 2015, the Serbian Ministry of Foreign Affairs stated that while they consider the affair a trivial matter, the "new state" does not impinge upon the Serbian border, which is delineated by the Danube. Croatia, which currently administers the land in question, has stated that after international arbitration, it should be awarded to Croatia or Serbia, not to a third party. A government with ten to twenty members has been suggested for the administration of Liberland, to be elected by electronic voting. Liberland intends to operate on an open-border policy. The goal of the micronation, as claimed by its website, is to create "a society where righteous people can prosper with minimal state regulations and taxes". The founders are inspired by countries like Monaco and Liechtenstein. Liberland has published a draft version of a codified constitution and a list of laws to be included in the constitution. These documents describe Liberland as a country governed under a three-power system with executive, legislative and judicial sectors that seek to promote individual rights, including property rights, freedom of speech and the right to keep and bear arms. It has also a list of criminal offences, which include "polluting environment", "public nuisance" in addition to crimes such as murder, manslaughter and theft. There are plans for an official cryptocurrency called Merit, although all other currencies would be allowed. There will be a maximum of 700 million merits. In an attempt to gain recognition at the UN, Liberland appointed 70 representatives in over 60 countries within a year of proclamation. As of February 2018, Liberland had recruited over 100 representatives in over 80 countries. According to its official webpage, Liberland is currently looking for people who have respect for other people and their opinions, regardless of their race, ethnicity, orientation, or religion, have respect for private ownership which is untouchable, and have not been punished for past criminal offences. Liberland received 200,000 applications in a week. In the beginning of May 2015, Liberland accepted around thirty citizens. An event was supposed to take place in the claimed territory, but Croatian border police stopped the group from entering it from the Croatian side. An attempt to cross the river with fishing boats from Serbia failed because the local fishermen didn't have permits for transporting people with their boats. Serbian police informed Jedlička that anyone trying to cross the border illegally would be arrested. An improvised ceremony was instead held in Bački Monoštor. On February 16, 2018, United States politician and former candidate for U.S. Presidency Ron Paul was officially presented with a Liberland passport and citizenship certificate by Jedlička and his cabinet. 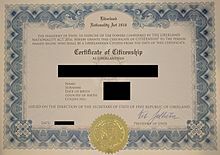 Jedlička initially offered "Liberland citizenship" for 10,000 merits, equivalent 1:1 to USD, but later reduced it to 5,000. There will be a cap of 140,000 citizenships. There has been no diplomatic recognition of Liberland by any member of the United Nations. However, Liberland has established relations with Somaliland, a self-declared state that proclaimed its independence from Somalia in 1991. Liberland and Somaliland signed a Memorandum of Understanding in September 2017 vowing to establish closer relations and cooperate in the areas of technology, energy and banking. Croatia: Liberland has been mentioned by the Croatian Ministry of Foreign and European Affairs but publicly rejected as a joke. On 29 June 2015, the Croatian Ministry of Foreign affairs said that Gornja Siga's status is undetermined, but it is not terra nullius, and after international arbitration, it will be awarded to Croatia or Serbia, not to a third party. However, in a May 2016 letter to the Croatian Interior Minister Vlaho Orepić, Croatian Minister of Foreign and European Affairs Miro Kovač referred to Liberland as "a provocative idea which has reached serious proportions" which "represents a risk to the Republic of Croatia." The letter called for finding a solution to "remove promotion and attempts of realization of idea of Liberland", recommending that "Ministry of the Interior, Security and Intelligence Agency (SIA), Ministry of Justice and Ministry of Foreign and European Affairs coordinate necessary measures and their actions, so that this provocative idea could be stopped." On 17 January 2017, Liberland was discussed and debated in the Croatian Parliament (Sabor) by politician Ivan Pernar of the Zivi Zid party, who claimed that Croatia should consider the recognition. Serbia: The Serbian Ministry of Foreign Affairs has stated that Liberland does not infringe upon the border of Serbia, but the project is seen as "frivolous". Egypt: The Egyptian Ministry of Foreign Affairs has warned people of the possibility of scams about Liberland directed at people looking for jobs abroad. "Egyptians should seek information from the Foreign Ministry rather than social media before travelling for work." Czech Republic: The Czech Ministry of Foreign Affairs disassociated itself from the activities of Mr. Jedlička, stating it has nothing to do with them. The ministry added that "Mr. Jedlička, as well as other Czech citizens staying in the territory of Croatia or Serbia, is obliged to abide by the local legal code. The Czech Republic considers the activities of Mr. Jedlička inappropriate and potentially harmful." Through the Embassy of the Czech Republic in Zagreb, it warned that the "efforts to create some new 'state' have no basis in international law," and that "in the territory of Croatia, citizens of the Czech Republic as well as other foreigners are obliged to adhere to the Croatian legal code, including the current regime on the Croatian-Serbian border. Crossing the Croatian border (i.e., the external border of the European Union) outside specified border crossings, as it is done by travelers to the so-called Liberland, is in clear violation of the code." Poland: On 24 July 2016, 7 members of Polish Parliament (Sejm) from Kukiz'15, in cooperation with local Liberland activists, asked Minister of Foreign Affairs Witold Waszczykowski when Poland would recognize the Free Republic of Liberland as an independent state, with a follow-up in August. The reply was that Liberland does not meet the criteria for statehood. Somaliland, a self-declared state internationally recognised as an autonomous region of Somalia, has begun the mutual recognition process with Liberland and commenced cooperation on a number of important fronts. Several minor parties with no elected representatives at their national level expressed support for the creation of Liberland. Czech Republic: On May 20, 2015, leader of the Free Citizens Party Petr Mach expressed his support for the creation of Liberland and wrote that he wants the Czech Republic to be a country similar to Liberland. Switzerland: On 16 of April 2015 The Swiss Independence Party up! (Unabhängigkeitspartei) led by Brenda Mäder supported the creation of Liberland and called for the recognition of Liberland by the Swiss Government. Spain: On May 31, 2015 the Spanish Libertarian Party expressed support for the creation of Liberland. Turkey: the Liberal Democratic Party (LDP) recognized Liberland as an independent state. Canada: On February 19, 2018 the Libertarian Party of Canada expressed their support for the creation and recognition of Liberland. United States: In December 2018, the U.S. Libertarian Party expressed their support for the creation and recognition of Liberland. A few micronations have expressed support for the idea of Liberland. The Kingdom of North Sudan, which claims the Bir Tawil area on the border between Egypt and Sudan, has recognized Liberland. The Kingdom of Enclava, which claims part of the disputed pocket north of Liberland, has recognized Liberland. The Principality of Sealand has indicated their support for Liberland. On 16 April 2017 Bitnation has announced a partnership with Liberland. On 20 April 2017 Liberland applied for admission to the UNPO. The application was officially presented and defended a month later in Brussels, Belgium. In June 2017, a delegation from Liberland was invited to observe the proceedings of the 13th General Assembly during which the President and members of the presidency were elected. ^ "Free and Fair - Liberland National Anthem". YouTube. ^ Quito, Anne. "The world's newest micro-nation is already a leader in nation branding". Quartz. Retrieved 2016-06-09. ^ "The country recently named Thomas Walls, a U.S. citizen, as its foreign minister". The Washington Post. 22 January 2017. Retrieved 13 March 2018. ^ "Jedličkův Liberland má novou měnu i první firmu v rejstříku, občanství chce 87 tisíc lidí". Aktuálně.cz - Víte co se právě děje. Retrieved 2016-06-09. ^ Quito, Anne. "The world's newest micro-nation is already a leader in nation branding". Quartz. Retrieved 2017-11-23. ^ a b Nolan, Daniel (25 April 2015). "Welcome to Liberland: Europe's Newest State". Vice News. Retrieved 25 April 2015. ^ a b Palmeri, Tara (2 September 2016). "Looking for Liberland". POLITICO. ^ "Liberland, medijska bomba koja zabavlja stanovnike 'države'". Al Jazeera Balkans. 23 April 2015. ^ "Balkans: Czech man claims to establish 'new state'". BBC News. Retrieved 17 April 2015. ^ a b c Martínek, Jan (15 April 2015). "Člen Svobodných vyhlásil na území bývalé Jugoslávie vlastní stát" (in Czech). Novinky.cz. Právo. Retrieved 15 April 2015. ^ "Čech si medzi Srbskom a Chorvátskom založil vlastný štát" (in Slovak). sme.sk. TASR. 15 April 2015. Retrieved 15 April 2015. ^ Klemenčić, Mladen; Schofield, Clive H. (2001). War and Peace on the Danube: The Evolution of the Croatia-Serbia Boundary. Durham, England: International Boundaries Research Unit. p. 19. ISBN 9781897643419. ^ a b c "Somaliland says it wants closer cooperation with unrecognised Liberland". BBC News. 26 September 2017. Retrieved 11 October 2017. ^ a b c "The Free Republic of Liberland has successfully begun the mutual recognition process with the Republic of Somaliland". Somaliland Informer. 27 September 2017. Archived from the original on October 12, 2017. Retrieved 11 October 2017. ^ a b Panenka, Radim (20 April 2015). "Navštívili jsme nový stát Liberland, který v Evropě založil Čech Vít Jedlička. Podívejte se, jak to tam vypadá" (in Czech). Parlamentní Listy. Retrieved 20 April 2015. ^ a b c d e f Koulová, Zuzana (15 April 2015). "On to myslí vážně! Vít Jedlička, zakladatel nového státu Liberland, promluvil. Zavádí elektřinu, internet, všechno. A lidé se k němu hrnou" (in Czech). Parlamentní Listy. Retrieved 15 April 2015. ^ CZ: Liberland (video) (in Czech). Medium Europe. 15 April 2015. Retrieved 17 April 2015. ^ a b c "Čeh proglasio državu između Srbije i Hrvatske" (in Serbian). B92. BETA. 15 April 2015. Retrieved 15 April 2015. ^ a b Panenka, Radim (21 April 2015). "Je to smršť! Skoro nespím, osadníci se hrnou, noviny se předhánějí. My to prostě uděláme, slyšel plný sál od Víta Jedličky, zakladatele státu Liberland" (in Czech). Parlamentní Listy. Retrieved 21 April 2015. ^ "Meet the man who is setting up a new country in the middle of Europe". The Independent. Retrieved 2016-04-18. ^ "Twitter". mobile.twitter.com. Retrieved 28 December 2015. ^ "Liberland". Video (in Serbian). Retrieved 2018-11-10. ^ a b "Police in the Balkans block inauguration of Europe's new "mini-state"". Associated Press. 9 May 2015. Retrieved 9 May 2015. ^ Ristić, Borislav (11 May 2015). "Putovanje u Liberland zasad stoji 2400 kuna – tolika je kazna za ilegalni prijelaz granice" (in Croatian). Večernji List. Retrieved 12 May 2015. ^ Getto, Ivica (11 May 2015). "Osnivač Liberlanda kažnjen s 2400 kuna za ilegalni prelazak hrvatske granice" (in Croatian). Glas Slavonije. Retrieved 11 May 2015. ^ Wirnitzer, Jan (11 May 2015). "Jedličkova bitva u Moháče. Všichni nám tu fandí, říká tvůrce Liberlandu" (in Czech). iDnes. Retrieved 24 May 2015. ^ Ristić, Borislav (9 May 2015). "Vid Jedlička uhićen nakon ulaska na teritorij Liberlanda" (in Croatian). Večernji List. Retrieved 10 May 2015. ^ Třeček, Čeněk; Sedlářová, Barbora (10 May 2015). "Chorvatsko zatklo "prezidenta" Liberlandu. Bylo to přátelské, tvrdí Čech" (in Czech). iDnes. Retrieved 10 May 2015. ^ Hayden, Sally (11 May 2015). "President of Liberland Arrested for Trespassing into His Own Self-Declared Country". Vice News. Retrieved 11 May 2015. ^ "Croatia: Liberland's president arrested again". inSerbia. 17 May 2015. Retrieved 24 May 2015. ^ Spasojević, Vesna (17 April 2015). "Liberlend, zemlja koje – nema" (in Serbian). Radio Televizija Vojvodine. Retrieved 18 April 2015. ^ "Igrali odbojku na 'plaži u Liberlandu' pa ih uhitila hrvatska policija - Večernji.hr". Vecernji.hr. 13 June 2015. Retrieved 23 December 2015. ^ Bradarić, Branimir (20 June 2015). "Liberland optužuje Hrvatsku za invaziju" (in Croatian). Večernji List. Retrieved 20 June 2015. ^ Hayden, Sally (19 June 2015). "Liberland Accuses Croatia of Invasion and Releases Video of 'Citizen' Abduction". Vice. Retrieved 20 June 2015. ^ Simone, Alina (29 June 2015). "On the Danube, the world's newest micro-nation. But Liberland has a problem". Retrieved 18 July 2015. ^ "Man forms own European country and more than 160,000 people want citzenship [sic] – trouble is, you can't get in". 11 May 2015. Retrieved 24 April 2015. ^ "Ptejte se lídra Strany svobodných občanů v Královéhradeckém kraji Víta Jedličky - Hradecký deník". Hradecký Deník (in Czech). 18 Oct 2013. Retrieved 15 May 2017. ^ "Petr Mach | ParlamentniListy.cz – politika ze všech stran". Parlamentnilisty.cz. Retrieved 23 December 2015. ^ Stroukal, Dominik (18 April 2015). "Několik nestrukturovaných poznámek k Liberlandu" (in Czech). Ludwig von Mises Institut – Česko & Slovensko. Retrieved 18 April 2015. ^ Vojković, Goran (12 May 2015). "Liberland je Srbija!" (in Croatian). index.hr. Retrieved 14 May 2015. ^ "Introducing Liberland, Europe's Newest Country". stratfor.com. Stratfor. 25 September 2016. Retrieved 24 October 2016. ^ "Croatian police question Czech leader of wannabe country 'Liberland'". 10 May 2015. Archived from the original on 26 January 2016. Retrieved 18 July 2015. ^ "Liberland's leader detained while trying to enter the country he just invented". 11 May 2015. Retrieved 19 July 2015. ^ a b McKirdy, Euan (25 April 2015). "Liberland: Could the world's newest micronation get off the ground?". CNN. Retrieved 25 April 2015. ^ a b "Mađarska - MVEP • On Virtual Narratives at Croatia's Borders". hu.mvep.hr. Retrieved 2016-06-09. ^ "Jedličkův Liberland má novou měnu i první firmu v rejstříku, občanství chce 87 tisíc lidí". Aktuálně.cz - Víte co se právě děje. Archived from the original on 11 June 2016. Retrieved 9 June 2016. ^ a b "Libertarian Paradise - Interview with the First President of Liberland | Finance Magnates". Finance Magnates | Financial and business news. 2018-11-12. Retrieved 2019-01-28. ^ "Welcome to Liberland: the nation that Bitcoin built". ^ Nolan, Daniel (24 April 2015). "Liberland: hundreds of thousands apply to live in world's newest 'country'". The Guardian. Retrieved 24 April 2015. In the week since Liberland announced its creation and invited prospective residents to join the project, they have received about 200,000 citizenship applications – one every three seconds – from almost every country in the world. ^ "Almost 10,000 Syrians have registered to live in a country that might not exist". Retrieved 2019-02-25. ^ Tešija, Jelena (23 April 2015). "Svjetski mediji dosta ozbiljno shvaćaju onog tipa koji pokušava osnovati mikrodržavu na Dunavu". Telegram (in Croatian). Retrieved 23 April 2015. ^ Fayed, Hanan (23 April 2015). "Foreign Min. warns Egyptians against emigrating to Liberland". The Cairo Post. Archived from the original on 6 July 2015. Retrieved 23 April 2015. ^ "Prohlášení MZV ke kauze tzv. Liberlandu". www.mzv.cz. May 14, 2015. Retrieved 2016-06-08. ^ "Upozornění Velvyslanectví ČR k cestám do tzv. "Liberlandu"" (in Czech). Velvyslanectví České republiky v Záhřebu (Embassy of the Czech Republic in Zagreb). 15 May 2015. Retrieved 24 May 2015. ^ "Interpelacja nr 4903. Do ministra spraw zagranicznych. W sprawie notyfikowania uznania niepodległości Wolnej Republiki Liberlandu" [Interpellation No. 4903. To the Minister of Foreign Affairs. On the notification of recognition of the independence of the Free Republic of Liberland]. sejm.gov.pl (in Polish). 22 August 2016. ^ "Odpowiedź na interpelację ponowną nr 4903. W sprawie notyfikowania uznania niepodległości Wolnej Republiki Liberlandu" [Answer to the second question, No. 4903. On the notification of recognition of the independence of the Free Republic of Liberia]. sejm.gov.pl (in Polish). 26 September 2016. ^ "The Transitional Federal Charter of the Somali Republic" (PDF). University of Pretoria. 1 February 2004. Archived from the original (PDF) on 25 March 2009. Retrieved 2 February 2010. ^ Liberland (2017-09-26). "The Free Republic of Liberland has successfully begun the mutual recognition process with the Republic of Somaliland". Liberland Press. Retrieved 2019-01-18. ^ "Somaliland: Liberland Starts Mutual Recognition Process with Government in Hargeisa - Somaliland Sun". Somaliland Sun. 2017-10-12. Archived from the original on March 8, 2017. Retrieved 2018-08-10. ^ "Liberland Micronation Recognized by Somaliland | Every World Heritage Site". Every World Heritage Site. 2017-10-13. Retrieved 2018-08-10. ^ "Petr Mach | ParlamentniListy.cz – politika ze všech stran". www.parlamentnilisty.cz. Retrieved 2018-08-01. ^ "up! fordert die Anerkennung der Freien Republik Liberland – up!schweiz". up-schweiz.ch. Retrieved 24 January 2016. ^ "El P-LIB, con la República Libre de Liberland | P-LIB | Partido Libertario". www.p-lib.es (in Spanish). Retrieved 2018-08-01. ^ "Habertürk – Captioned". Dotsub. Retrieved 23 December 2015. ^ "Libertarian Party of Canada Chairman vows to recognize Liberland". Twitter. Retrieved 21 February 2018. ^ Staff (2018-12-12). "Libertarians resolve to support development of Liberland". Libertarian Party. Retrieved 2018-12-14. ^ Liberland (2018-12-03). "US Libertarian Party now supports recognition of Liberland". Liberland Press. Retrieved 2018-12-14. ^ "The Kingdom of North Sudan recognized the Liberland". Kingdom of North Sudan News Channel. 20 April 2015. ^ a b "Introducing Liberland, Europe's Newest Country". www.stratfor.com. Retrieved 2017-05-15. ^ "About – enclava.org". enclava.org. Retrieved 2017-05-15. ^ "Liberland's Claim To Independence". www.sealandgov.org. Retrieved 2017-05-15. ^ Vickery, Nate (2016-08-17). "The Green Nation of Liberland: Plausible or Far Fetched – TechMalak". TechMalak. Retrieved 2017-05-15. Wikimedia Commons has media related to Liberland. Wikivoyage has a travel guide for Liberland. Documentary film about Liberland – "This No Man’s Land Of Mine"
This page was last edited on 18 April 2019, at 12:58 (UTC).